Abrasion resistance is one of the most important properties of an industrial concrete floor. Large commercial warehouses and distributions centres have large numbers of moving equipment and personnel using their floors on a daily basis and therefore it is essential that the quality of these concrete floors is such that they can withstand the wear and tear of daily use over extended periods of time. 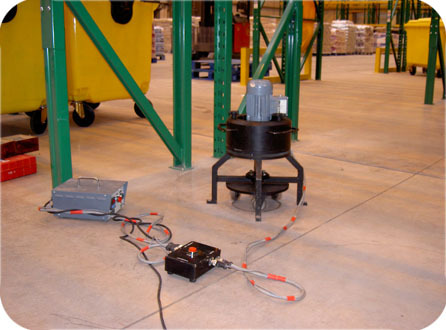 The abrasion resistance of concrete floor surfaces is assessed by means of an accelerated abrasion machine (see pictures). 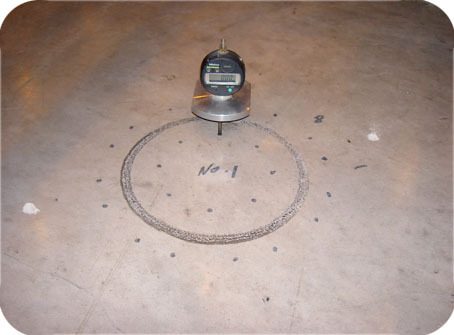 This unique apparatus exposes the floor surface to three hardened steel wheels rotating over a ring shaped area for a fixed number of revolutions under a standard load to simulate wear and tear of machinery such as fork lift trucks. The depth of wear within the ring pattern is measured to an accuracy of 0.01 mm at 8 equally spaced points, and the average depth of wear is calculated. This depth of wear is used to indicate the quality of the floor in terms of abrasion resistance. The British Standard 8204: part 2:2002 classifies the quality of concrete floors by four categories. Our accelerated abrasion machines complies specifically with the requirements of EN 13892-4 (With Certificate of conformity) and our site service provides totally independent assessment of the quality of the industrial concrete floors which can be used for quality assurance or settlement of disputes. After each assessment, Aston Services provide a comprehensive report which compares the field results and classifies the industrial concrete floor in accordance to the British Standard 8204: part 2:2002. In circumstances where the classification is lower than required, Aston Services are able to investigate and determine the reason. We have extensive experience in undertaking rigorous assessment of concrete floor quality and since our inception, we have been responsible for undertaking several hundred reports for many major companies. Our clients range from flooring contractors including Stewart Industrial Flooring and Twintec Industrial Flooring, consultants including Atkins and Mouchel and large retailers including IKEA and eBuyer. Aston Services can also provide expert witness for clients and have provided this successfully on many occassions.